Kyly Clarke has landed a hot new gig, on Channel 7's The Morning Show. And she’s out to prove she’s more than just a WAG. Get ready to see Kyly Clark on your screens a whole lot more. 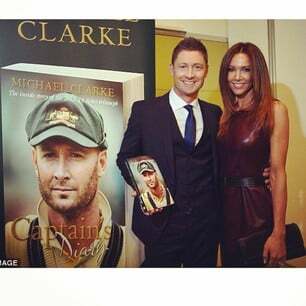 The wife Australian cricket Michael Clarke has landed a new presenting gig, on Channel 7’s The Morning Show with Larry Emdur and Kylie Gillies. Kyly, 33, dropped by the show this morning to announce the new segment, where she’ll give out interior styling tips to viewers. “I’m trying to focus a lot more on interiors because that is my passion and that is obviously my other trade,” Kyly said. Kyly appeared on The Morning Show with Kylie and Larry. Kyly is no stranger to television, having previously worked as a weather presenter as well as her recent appearance on Dancing With the Stars. So what can us viewers expect? Kyly says she&apos;ll focus on the silly season first with "some interior tips and tricks and what you can do for Christmas and some great colour schemes you can work on." Kyly Clarke in her fitness gear. And her new television gig isn&apos;t the only thing keeping her busy. Kyly is about the launch her new health and fashion blog Lystyled, which will feature health, well being and style tips as well as recipes and fitness plans. Looks like we have ourselves an Aussie Gwyneth Paltrow! Kyly and Michael ClarkeMichael and Kyly Clarke. The real reason why Kyly Clarke departed from Dancing with the stars. Pippa Middleton has scored a surprising new job.